How do online agents work? They tend to cover the whole of the country from one central office, allowing them to keep their costs down and consequently charge sellers a much lower fee than most traditional agents. Importantly the online agent should still list all its properties on the UK’s most dominant and visited property websites, namely Rightmove and Zoopla. These are the sites used by the vast majority of all buyers and sellers but consumers are not allowed to advertise on them directly, they need to go via an estate agent. Traditional ‘high street’ agents advertise on exactly the same websites but they will usually charge the seller a much higher fee, partly to cover their own higher costs. Most online agents will handle all the enquiries that come in from Rightmove and Zoopla and organise for potential buyers to view the property. All the seller needs to do is show people round the property at the time they agreed. After the viewing, the online agent should then contact the potential buyers to see if they are interested in making an offer. The agent’s job is to obtain the best price they can for the seller. 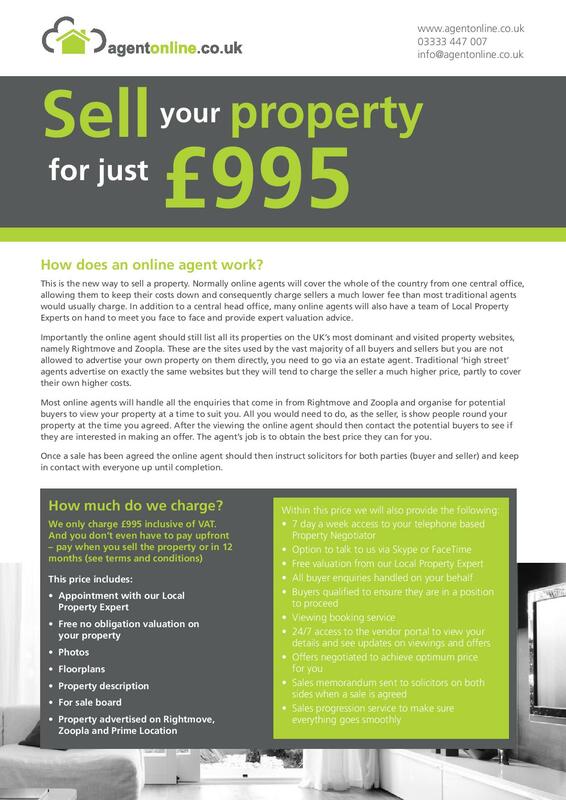 Agent Online is one of these new breed of agents and we have come up with a brand new concept partnering with mortgage brokers and IFAs to offer their clients a leading estate agency service. We are backed by a group of interesting investors and our primary focus is working with intermediaries in the mortgage and financial planning market place. The information on this website will hopefully answer any questions you have regarding how the service works and help you decide whether you want to become a Partner or Introducer to Agent Online. 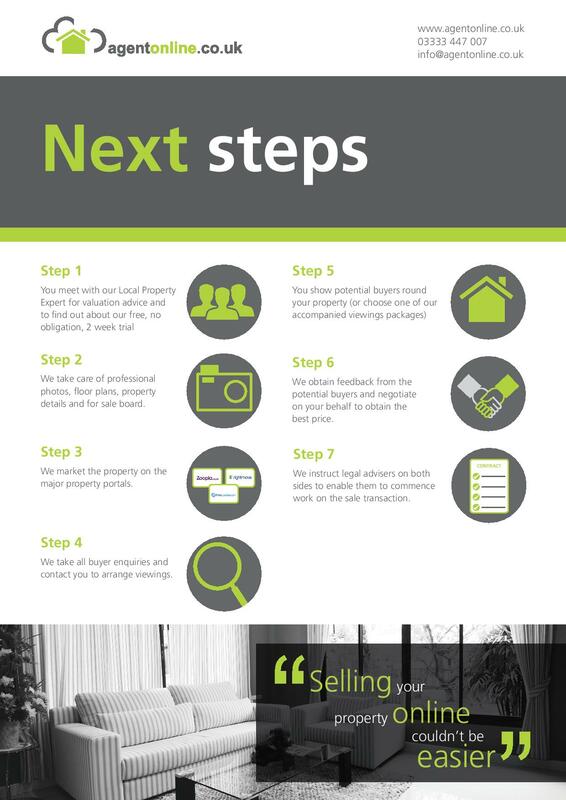 The Next Steps page allows you to sign up online. If you have any questions at all please call our support team on 03333 447 007 or email brokers@agentonline.co.uk. …and we’ll refer anyone viewing your clients’ properties to you to check affordability. Every time your client’s property has an enquiry for a viewing we have to ensure they are ready to proceed financially. At this point we will ask you, the referring broker, to vet the potential buyer to see if they are likely to qualify for a mortgage. In many cases this will give you an opportunity to offer your own services and provide the buyer with mortgage advice. Introducer – this option is free, you receive a referral fee of £100 per listing and have access to some marketing support to help promote the service to clients. Ideal if you may only have one or two clients to refer every year. Complete has a limited number of Partnership licences available at a 60% discount- pay just £39pm ! Apart from the obvious – that is the huge cost saving – there is another reason why your client might want to consider us: We are experienced property people but with a fresh approach to estate agency. Our goal is to offer an exceptional service to buyers and sellers and provide real value for money. The service uses clever technology and combines it with a professional, highly trained team of Property Negotiators available over the phone 7 days a week. We recognise that some tasks are easy to do online (e.g. the client & referring broker can log onto the vendor portal to check feedback on any offers from people that have viewed your property). But sometimes a seller may just want to speak to someone to ask for help or to run through a specific query – hence our decision to make the Property Negotiators available at the end of the phone every day of the week. There is no reason at all why it should take longer to sell using an online agent than via a ‘high street’ agent. 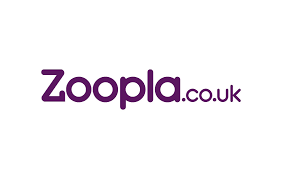 In fact there is an argument to say that our extended opening hours may mean we find a buyer quicker than an agent that is only open from 9am-5pm for five or six days a week.Your clients will also find that many ‘high street’ agents don’t advertise on both Rightmove and Zoopla. These are by far the most popular property websites in the country so by advertising on both your clients can be sure of maximising their properties’ online presence. How do we compare with other agents? 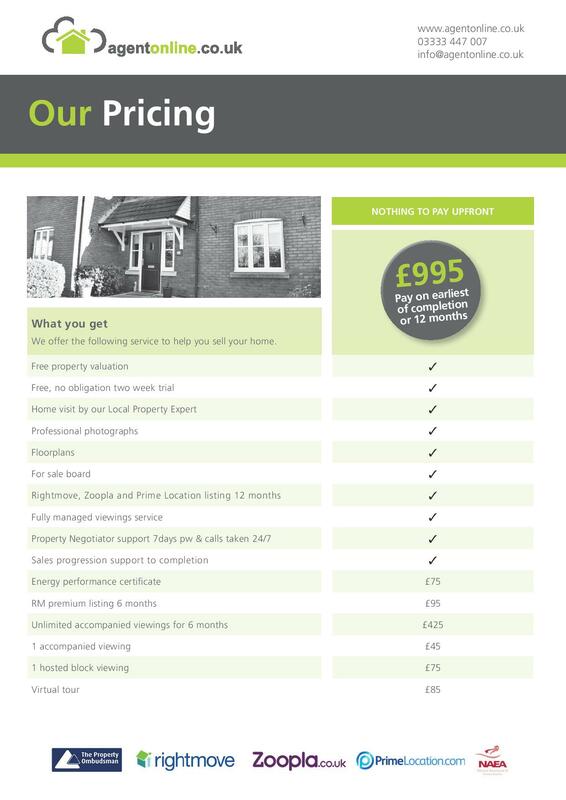 We provide your client with everything they will need to sell their house or flat – all for a fixed fee of just £995. There is no reason for them to pay more – on average sellers that use the Agent Online service are saving over £4,000 in unnecessary fees. 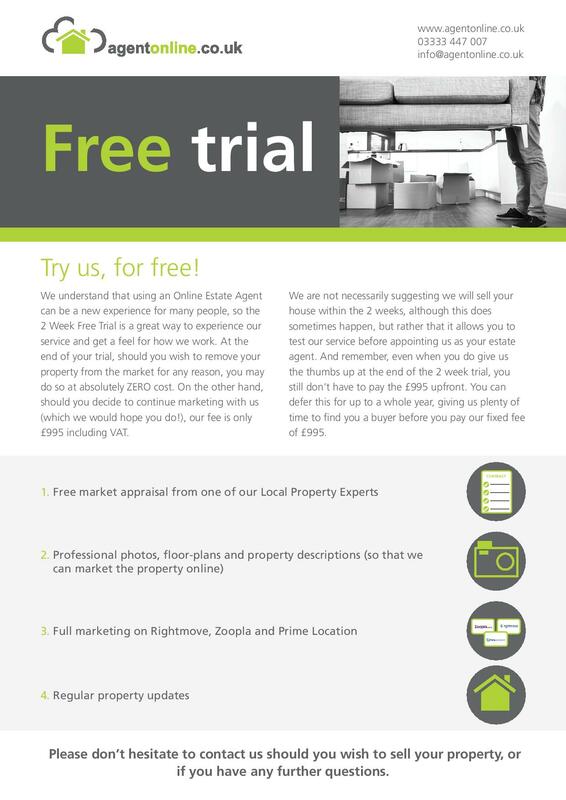 Below you will find a range of client facing leaflets that can be downloaded and either emailed to a client or printed. They are Agent Online branded and available to all Introducers. If you have signed up to be an Agent Online Partner, all marketing material can be branded with your own logo alongside Agent Online’s. To discuss becoming a Partner please call the support team on 03333 447 007.